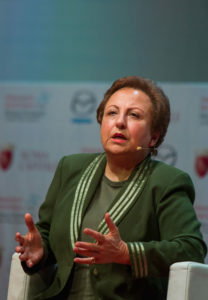 Nobel Peace Laureate 2003, Shirin Ebadi, Iranian lawyer and human rights defender.  Shirin Ebadi received the Nobel Peace Prize for her efforts for democracy and human rights, in particular, those of women and children. A graduate of the Faculty of Law, Tehran University, and one of the first female judges in the country, Ms Ebadi presided over a municipal court in Tehran. After the 1979 Islamic Revolution, she was forced to resign. In 1992, she opened her own law practice and became an attorney. Shirin Ebadi represented many oppositionists before Iranian courts. She was also involved in defending the rights of refugees. Since June 2009 she has been in exile in the UK, forced to leave Iran because of mounting persecution of the regime’s critics. In 2004 she appeared on Forbes list of the World’s 100 Most Powerful Women. Democracy doesn’t recognize east or west; democracy is simply people’s will. Therefore, I do not acknowledge that there are various models of democracy; there is just democracy itself.